What’s a Super Bowl party without amazing food, right? Unfortunately, for those of us with weight loss goals, those high-calorie snacks can serve as a setback. 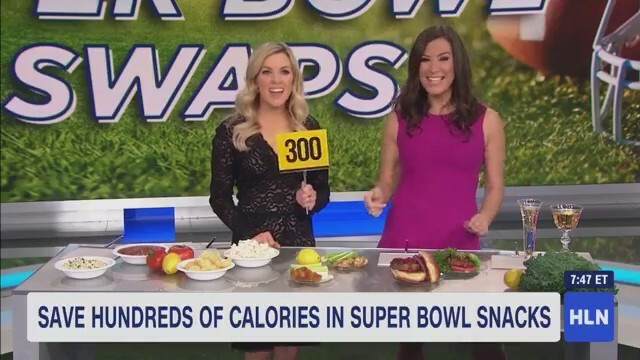 Health and Fitness Expert and Women’s Weight Loss Coach Stephanie Mansour stopped by Headline News to fill you in on how to save hundreds of calories while still enjoying your favorite party foods! Steph specializes in weight loss programs for women and believes in keeping her clients from ever feeling deprived in their day to day lives. Let’s talk about how to cheer your team on while still making healthy food choices on game day! Here are a bunch of popular Super Bowl party foods and their calorie contents compared to some lighter—but still delicious—alternatives! It can be a little too easy to fall into a bowl of artichoke dip! If you take a look at the calories in just one serving (and who is going to only eat one serving, honestly?!) it may not be so tempting. That creamy dip runs around 114 calories per serving, whereas the same amount of salsa will only contain 10. Make the swap and you’ll save 104 calories easily! There are 160 calories in just one 1 oz. serving of potato chips, whoa! If you opt to snack on some air-popped popcorn with some seasoning sprinkled on instead, you can enjoy a whole 1 cup serving for just 30 calories. That’s a savings of 120 calories or you can snack up to five cups of that popcorn for the same amount of calories as one serving of chips. A little swap that will go a long way if you’re extra hungry! Another good swap I always tell my own private weight loss clients to keep in mind: ditch the tortilla chips in favor of some sliced veggies. 2 fried wings + 1.5 oz bleu cheese = 470 calories vs 2 baked wings + 2 TBSP salsa = 170 calories. That’s right…you could save 300 calories per serving with this swap! You’ll save over 200 calories simply by saying no to a hamburger bun and wrapping your burger in lettuce instead. Good protein boost, great flavor, and more room for dessert or drinks! If you love the bun too much, just ditch half of it and do an open-faced burger. Opting for a leaner hamburger meat will save you calories from fat as well. This swap works for sandwiches too! You’ll save ~115 calories by making your sandwich open-faced instead of two slices of bread. If you love to indulge in a boozy beverage when you’re hanging out with your friends and waiting to scream over touchdowns—you’re in good company! Save around 60 calories by filling your wine glass with half sparkling water. If you’re paying attention that means you can have twice the drinks for the same amount of calories!